The Italian watermark suggests that the plan was indeed made in Italy. It is, for example, found on four of Soane's measured drawings of Italian buildings. Despite the note on the drawing inscribed by an early curator - Plan of a Design for a Triumphant Bridge / The original Drawings of this design were presented to La Ducale Parmense Accademia delle Belle Arte 1779 - it was not necessarily this design based on Dance's simpler plan (shown on drawing 6a LHS) but the more complex one that was adopted and submitted by Soane to the Parma Academy. Or so it seems from the inscription on the original frame of a perspective exhibited at the Royal Academy in 1799 which reads 'View of a design for a triumphal bridge made from / the original drawings presented to la Ducale Parmense Accademia delle Belle Arti MDCCLXXIX' see drawing 14).A pricked-through line from the centre of one end of the drawing catalogued here indicates that Soane may have proposed making a perspective. 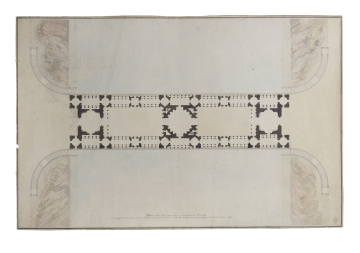 A perspective by Gandy made in 1799 (drawing 17) from a low viewpoint, records an elevational treatment not found in any other of the triumphal bridge drawings; it relates very closely to this plan and between them, the two drawings (7 and 17) represent the better of the two Doric Triumphal Bridge designs. Soane submitted his design for a triumphal bridge to the Parma Academy on 9 May 1780 (those drawings are now missing). A diploma of honorary membership dated '13 Marzo 1781' (SM Priv.Corr. XIV.A.4) is in the Soane Museum and the Downhill note/sketchbook (SM volume 80, p.44 verso, q.v.) dated April 1780 lists letters to be written headed by 'Il conte di Torre di Rezzonico`a Parma' - Carlo Gastone della Torre di Rezzonico, secretary of the Parma Academy.